Vial containing swab from a deceased duck, collected for testing during the 2014-2015 avian influenza outbreak. Photo © 2015 Erica Cirino, used with permission. In particular, experts warn the absence of monitoring could have long-term consequences if an outbreak occurs or a new disease arrives in the country. “If it’s a novel introduced pathogen, the lack of timely testing could result in more deaths and potential spread of disease,” according to a federal employee who spoke to The Revelator on the condition of anonymity, because they are not permitted to discuss their work during the shutdown. Rhode Island State Veterinarian Scott Marshall, who works with the USDA to address outbreaks of disease in domestic animals — including those transmitted by wildlife — says government shutdowns are probably not likely to specifically cause wildlife disease outbreaks. Instead, he says, shutdowns are probably more likely to affect the government’s ability to respond to such outbreaks if they occur during a period when fewer personnel and resources are available. That has the potential to happen during the current shutdown, as the U.S. is currently in the midst of a major avian disease outbreak spread by wild birds and infecting large numbers of domestic fowl. The outbreak began last May, when the National Veterinary Services Laboratory confirmed a case of fatal Newcastle disease in a small flock of backyard chickens in Los Angeles County. The virus can cause neurological, respiratory and digestive systems failure, and sudden death, with a mortality rate of 100 percent in unvaccinated fowl. The disease spread quickly, first to hundreds of backyard flocks and now to laying hens on three large commercial poultry operations in Southern California. The California state veterinarian, Annette Jones, has mandated euthanasia of all poultry in Los Angeles, Mira Loma/Jurupa Valley, Muscoy and Perris counties. About half a million birds have been, or are expected to be, euthanized as a result of the outbreak. It’s a large number that continues to grow, despite government and state intervention. “This is serious,” she wrote. Despite the still-worsening problem, the shutdown has forced the Department of Agriculture Animal and Plant Health Inspection Service to deploy significantly fewer employees than it has in previously outbreaks. The Revelator has verified with USDA-APHIS that the agency had just 33 employees in California on January 10 working to respond to this still-developing outbreak of deadly Newcastle disease. The agency had another eight working virtually, alongside 105 California Department of Food and Agriculture employees. This mobilization pales in comparison to a previous outbreak that cost the country billions of dollars. To see how the current Newcastle case is affected by the current shutdown, it’s important to look back at a previous outbreak that occurred while the government was fully funded. In December 2014 the worst-ever U.S. epidemic of highly lethal avian influenza hit the nation after wild birds from Asia spread the disease to their counterparts in the Americas, which then spread the disease to farmed poultry. The deadly outbreak lasted six months and led to the combined deaths and euthanasia of more than 50 million chickens, turkeys and other domestic fowl. The outbreak cost the U.S. economy more than $3.3 billion in lost revenues and sent the price of eggs skyrocketing. According to USDA documents, more than 3,400 personnel — including 250 USDA-APHIS employees — were on the ground at the height of the 2014 outbreak. That’s 100 times more than are deployed during the current outbreak and government shutdown. Federal employees’ jobs at the time included running disease tests on deceased wild birds, as well as testing, euthanizing and disposing of diseased domestic fowl. The outbreak response, which ended up costing the government $850 million, was the most expensive animal health event in American history. Luckily no humans were affected by the disease in North America — quite likely because the government was functioning properly at the time. Diseases can also solely strike wild populations — and monitoring some potential causes of those situations is another critical government function hobbled by the shutdown. Marshall, the Rhode Island state veterinarian, says controlling disease in wildlife is naturally challenging and relies on monitoring trade — legal and otherwise. “The main governmental tool to stop spread of disease is regulation of animal movement, both internationally and interstate,” he says. If activities to prevent the smuggling of wildlife into the United States are reduced or eliminated during the shutdown, the lack of resources could increase risks of foreign diseases spreading, Marshall notes. Ongoing efforts to prevent the spread of foreign wildlife, insect and plant diseases into the continental United States have continued since the shutdown began, but on a more limited basis with fewer staff at work, according to federal contingency documents. Meanwhile tens of thousands of government workers directly involved with the wellbeing of the nation’s wildlife, spanning multiple federal agencies, have been forced to cease all “nonessential” activities — those unrelated to human life or property. Federal employees are not allowed to go to their offices, use government equipment, answer emails or discuss the shutdown. 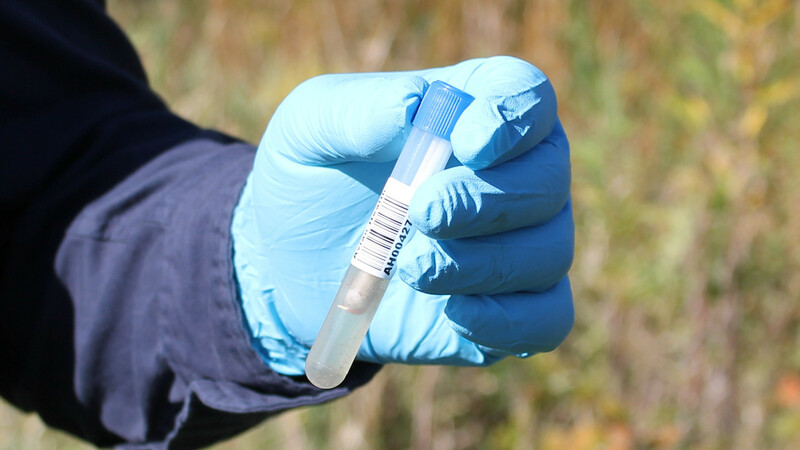 This involves personnel responsible for running tests that could preemptively detect diseases in wildlife and hasten the response to any diseases that are detected, according to federal contingency documents. Additionally, public affairs officials we reached out to say they have been forbidden to reply to media requests. If the shutdown continues, experts warn that lack of communication could slow public response to any emerging threats. Despite the risk that wildlife diseases like Newcastle and avian influenza pose to farm animals, and in some cases also humans, the government has not dedicated any personnel to monitoring for possible disease during the shutdown. Similarly, nearly all of agencies’ long-running research projects, even those with both government and nongovernment partners that offer insight into wildlife health and could detect disease, have been put on hold. Notably, the world’s longest-running monitoring program of a predator-prey relationship, the Isle Royale Moose/Wolf Project, is currently at risk of being completely scrapped this winter season due to the shutdown, according to news coverage of the issue. This monitoring project helped document a major decline in wolves during a parvovirus disease outbreak in the early 1980s. Kira A. Cassidy, a research associate with the Yellowstone Wolf Project, which falls under the jurisdiction of the National Park Service, says all of her agency’s ongoing research projects — including those involving disease — have been put on hold. In Yellowstone the only activities now performed by federal employees include law enforcement, emergency dispatch and responders, and maintenance staff for roads, according to Cassidy. Other diseases have also started to emerge during the shutdown. For example, since last November Texas biologists have found about a dozen dead freshwater turtles belonging to three species — red-eared sliders, Texas river cooters and spiny softshells — in Tarrant County. Texas Parks and Wildlife Department press office manager Steve D. Lightfoot reports that state biologists have also noticed between 30 and 40 turtles showing signs of illness in the same area, though there have been no dead or sick fish or birds observed. The cause of the sick and dead turtles remains a mystery. He confirmed that there are about a half-dozen state employees working on the case, but that the number of on-call federal employees permitted to help is unknown. Normally state employees have unrestricted access to the appropriate federal employees, who can further investigate disease outbreaks in well-equipped federal laboratories. In the case of a wildlife disease “emergency” during a shutdown, standby federal employees who have the knowledge and experience to diagnose disease outbreaks are notified and are required to work with no pay. We asked Lightfoot if the government shutdown continues to affect his state agency’s efforts to get to the bottom of this turtle mystery. Experts warn that similar situations could play out across the country if the Trump administration and Congress continue to insist on keeping the federal government from operating.